Wednesday, January 8, would have been Andy’s fifth birthday. It’s hard for me to comprehend that it’s been five years since he entered this world – and left it so abruptly. After all of these years, the pain of his loss still takes my breath away. But, it also fills me with purpose. I made a promise to Andy before he died that we would continue his fight against SMA. That we would raise awareness. That his life, however short, would make a difference. And, that’s just what we have been doing for the past five years with Andy’s Army. Tomorrow, my husband Alan and I are among the honorees at Aurea McGarry’s Live Your Legacy Summit in St. Petersburg, Florida. We are so thrilled and humbled to share Andy’s story with the seminar attendees – and, more than that, to continue his legacy through them. Tonight, we attended the first of the Summit’s events, a Meet-and-Greet. 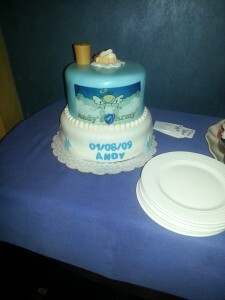 We were stunned (and left a bit teary-eyed) when the event’s organizer, Aurea McGarry, presented the room with a custom birthday cake from DessertXperts for Andy. It was such a beautiful tribute to our angel – and a delicious chocolate AND red velvet cake too. Andy would have loved it. We look forward to all of the surprises that Day Two of the Summit brings. We are so proud – and thankful – to be a part of it. What a lovely way to remember our beautiful little boy!